It is difficult to determine the nature and extent of Calvin’s affiliation with Mormonism following his move to Connecticut, but it is clear that he remained a Latter-day Saint for the rest of his life. The 1940 and 1955 LDS census records list him as a member of the Hartford Branch and then the New London Branch. He did not hold the priesthood which may indicate that LDS leaders in Connecticut were aware of his mixed racial heritage. His wife Carolyn was identified on the 1955 LDS census as a non-member. Calvin died of a heart attack in May 1957, at age 58. His memorial service was held at a funeral home in New London. Calvin’s brothers Milton and Leo traveled from Oshkosh to Quaker Hills to remember their brother and pay their respects to his widow Carolyn. The New London LDS branch clerk recorded Calvin's death in the branch record and indicated that Calvin "died in full fellowship." Church of Jesus Christ of Latter-day Saints, Record of Members Collection. CR 375 8, box 1442, folder 1, image 532; box 7701, folder 1, images 300-301; box 4166, folder 1, image 106. Church History Library, Salt Lake City, Utah. Franke, John Henry. Early Mormon Missionary database. Church of Jesus Christ of Latter-day Saints. Salt Lake City, Utah. Grant, James. Missionary Journal, 1903-1904. MS 19933. Church History Library, Church of Jesus Christ of Latter-day Saints, Salt Lake City, Utah. Kirchhoff, Calvin Everett. Selective Service Registration Cards. World War II, Draft Registration Cards for Connecticut, 1940-1947. National Archives and Records Administration. As archived at fold3.com. “Kirchhoff.” Presiding Bishopric stake and mission census, 1914-1935. CR 4 311. Church History Library, Church of Jesus Christ of Latter-day Saints, Salt Lake City, Utah. “Kirchhoff.” Presiding Bishopric mission census, 1940. CR 4 312. Church History Library, Church of Jesus Christ of Latter-day Saints, Salt Lake City, Utah. “Kirchhoff.” Presiding Bishopric stake and mission census, 1950-1960, 1962. CR 4 316. Church History Library, Church of Jesus Christ of Latter-day Saints, Salt Lake City, Utah. “Kirchhoff.” The New London Evening Day (New London, Connecticut), 27 May 1957, 2. Oshkosh Branch, Wisconsin. Northern States Mission. Record of Members, Historical, 1904-1907. CR 375 8, WR 4685. Church History Library, Church of Jesus Christ of Latter-day Saints, Salt Lake City, Utah. “Return from Funeral.” The Oshkosh Northwestern (Oshkosh, Wisconsin), 3 June 1957, 4. United States, Census. 1900, Wisconsin, Winnebago County, Oshkosh. United States, Census. 1910, Wisconsin, Winnebago County, Oshkosh. United States, Census. 1920, Connecticut, New London County, Waterford. United States, Census. 1930, Connecticut, New London County, Waterford. United States, Census. 1940, Connecticut, New London County, Waterford. Wisconsin, State Censuses, 1905. Database on-line at Ancestry.com. Originals at Wisconsin Historical Society, Madison, Wisconsin. Kirchhoff, Calvin Everett, Selective Service Registration Cards, World War II, Draft Registration Cards for Connecticut, 1940-1947, National Archives and Records Administration, as archived at fold3.com. United States, Census, 1900, 1910, Wisconsin, Winnebago County, Oshkosh; United States, Census, 1920, 1930, 1940, Connecticut, New London County, Waterford; Wisconsin, State Census, 1905, database on-line at Ancestry.com, originals at Wisconsin Historical Society, Madison, Wisconsin. United States, Census, 1900, 1910, 1920, Wisconsin, Winnebago County, Oshkosh. Oshkosh Branch, Wisconsin, Northern States Mission, Record of Members, Historical, 1904-1907, CR 375 8, WR 4685, p. 4, Church History Library, Church of Jesus Christ of Latter-day Saints, Salt Lake City, Utah; James Grant Missionary Journal, 1903-1904, MS 19933, pp. 21, 22, 30, 33-37, 51, 54, 58, Church History Library, Church of Jesus Christ of Latter-day Saints, Salt Lake City, Utah. Oshkosh Branch, Wisconsin, Northern States Mission, Record of Members, Historical, 1904-1907, 8-13, 15, 46. Church of Jesus Christ of Latter-day Saints, Record of Members Collection, CR 375 8, box 4166, folder 1, image 106, Church History Library, Salt Lake City, Utah. John Henry Franke, Early Mormon Missionary database, Church of Jesus Christ of Latter-day Saints, Salt Lake City, Utah. United States, Census, 1840, Connecticut, New London County, Waterford; “Return from Funeral,” The Oshkosh Northwestern (Oshkosh, Wisconsin) 3 June 1957, 4. 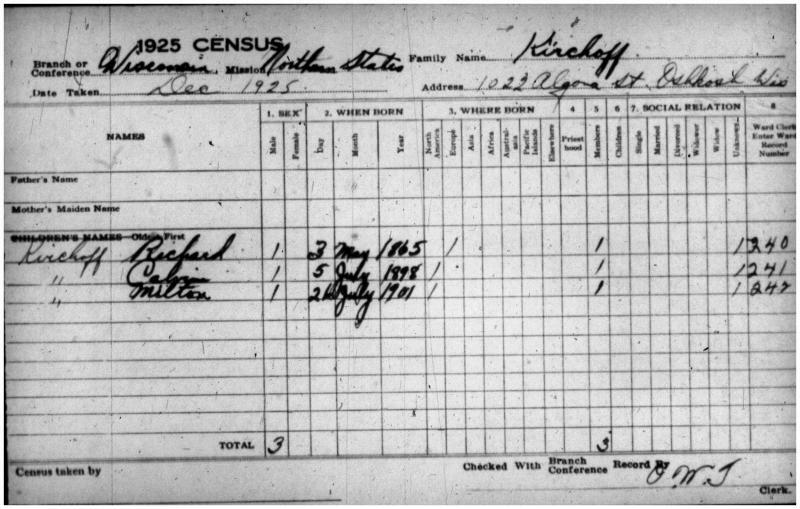 United States, Census, 1820, 1830, 1840, Connecticut, New London County, Waterford; “Return from Funeral,” The Oshkosh Northwestern, 3 June 1957, 4. “Kirchhoff,” Presiding Bishopric mission census, 1940, CR 4 312, Church History Library, Church of Jesus Christ of Latter-day Saints, Salt Lake City, Utah; “Kirchhoff,” Presiding Bishopric stake and mission census, 1950-1960, 1962, CR 4 316, Church History Library, Church of Jesus Christ of Latter-day Saints, Salt Lake City, Utah. Return from Funeral,” The Oshkosh Northwestern, 3 June 1957, 4; “Kirchhoff,” The New London Evening Day (New London, Connecticut), 27 May 1957, 2; Church of Jesus Christ of Latter-day Saints, Record of Members Collection, Connecticut State, Part 3, CR 375 8, box 1442, folder 1, image 532, Church History Library, Salt Lake City, Utah.